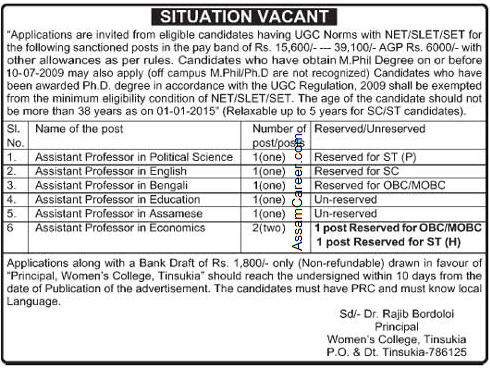 Applications are invited from eligible candidates having UGC norms for the following posts of Sibsagar College, Joysagar along with a Demand Draft for Rs. 1800/- in favour of Principal, Women's College, Tinsukia within 10 days from the publication of this advertisement along with all testimonials, and Permanent Resident certificate. Scale of pay : 15,600-39,000 + 6000 with other admissible allowances. Age: Maximum age of the candidates 38 yrs as on 1.1.2015 and relaxable 5 yrs for ST/SC candidates. Educational Qualification: Candidates must have NET/ SLET/SET as mandatory qualification, M.Phil Degree holder prior to 10/07/2009 and Ph.D. 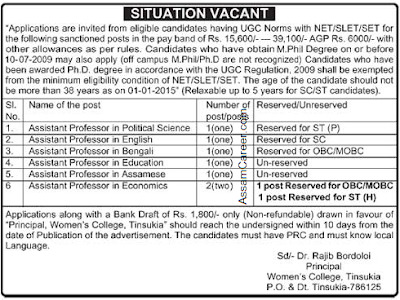 Degree holder as per UGC regulation 2009 are exempted from NET/SLET/ SET excluding off campus degree holders. applicants must know local language.